Nepal’s Prime Minister Khadga Prasad Sharma Oli was in China last week to bolster an important bilateral partnership in Nepalese foreign policy matrix. Though Oli is widely viewed as pro-Beijing in his outlook, he has been relatively cautious in his trying to maintain a semblance of balance in Kathmandu’s ties with China and India. His visit to China followed his visit to New Delhi a few months back and a relatively successful return trip by Prime Minister Narendra Modi last month that managed to put fraying India-Nepal relations back on track. Oli, for his part, committed Nepal to be a part of Xi’s pet project, the Belt and Road Initiative (BRI), which continues to be a point of friction between India and China. The China Pakistan Economic Corridor, part of the BRI, passes through Pakistan-occupied Kashmir, making it difficult for New Delhi to accept the project on grounds of territorial sovereignty. Oli also signed a memorandum of understanding (MoU) with China to build a strategic railway link connecting Tibet with Kathmandu through the Himalayan terrain. This will connect the Gyirong trading port in the city of Xigaze in Tibet with the Nepali capital Kathmandu. Chinese leaders have expressed a desire to work with Nepal to build an ambitious “cross-Himalayan connectivity network” through aviation, trading ports, highways and telecommunications. Oli has been a strong votary of greater connectivity with China. The initial feasibility study of the extension of the railway line from Tibet’s Kyrong to Kathmandu all the way to Lumbini, Buddha’s birthplace, has been completed. Sino-Nepal economic ties have grown dramatically over the last few years. At $79.26 million, China is Nepal’s biggest foreign investor, accounting for 58 per cent of foreign direct investment in the second half of last year, more than twice that of India’s $36.63 million. As India failed to deliver on its commitments in time, Nepal gravitated towards China. This has been especially the case in the hydropower sector where Chinese companies have made great strides in the last few years. But this is also a sector where Sino-Nepal ties have witnessed some turbulence. The previous Nepalese government led by Sher Bahadur Deuba scrapped a $2.5 billion deal with China’s state-owned Gezhouba Group to build a hydropower facility in the west of the country. Though Oli had suggested he would revive the project, a final decision on it is yet to be taken. Another $1.6-billion West Seti hydroelectric project that China’s Three Gorges Corporation was expected to complete along with the Nepal Electricity Authority by 2019 is also in trouble as the China and Nepal are still to finalise the terms of the pact. The Modi government has been trying to reset ties with Oli in such a context. It was India’s unofficial blockade of 2015 in opposition to certain terms of Nepal’s constitution which had triggered a wave of anti-India sentiment in the Himalayan Kingdom. Oli became a symbol of this anti-India sentiment and his election victory was a result of his standing up to Indian hegemony. Since his coming to power, New Delhi has been trying to woo him. Prime Minister Narendra Modi’s visit to Nepal last month was successful in recalibrating India-Nepal ties to some extent as he emphasised the cultural ties that bind the two nations beyond strategic and economic factors. He declared Nepal to be the centrepiece of his government’s “neighbourhood first” policy. “As Nepal enters a new era of consolidating gains of democracy and achieving rapid economic growth and development, India will continue to remain a steadfast partner of government of Nepal to implement its vision of samriddha Nepal, sukhi Nepali (prosperous Nepal, happy Nepal),” he declared. Modi inaugurated the Ramayan Circuit Bus Route that will connect Janakpur, Goddess Sita’s birthplace, to Ayodhya and with Oli he laid the foundation stone for the $1.4 billion Arun-3 hydropower plant in the east of the country. Most significantly, perhaps, he promised to resolve all pending issues in India-Nepal ties by September 19, Nepal’s Constitution Day. These include the trade deficit in favour of India, the exchange of demonetised Indian currency in Nepal and lack of progress in India funded projects in Nepal. 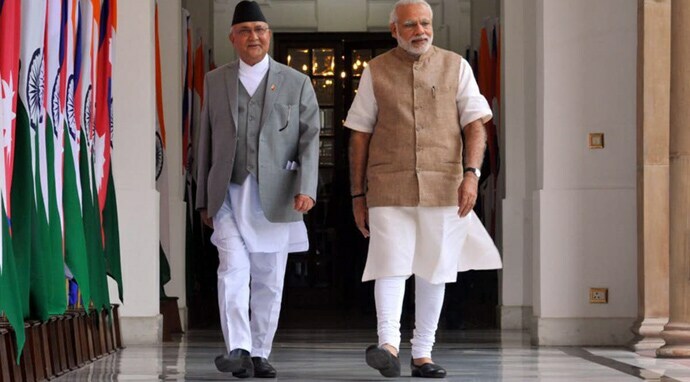 India recognises the challenge it faces in keeping its ties with Nepal on track. Chinese growing presence in Nepal is a reality that India can do little about. There is no point bemoaning Chinese presence. Instead, India should be providing an alternative narrative for India-Nepal ties, one that takes into account longstanding people-to-people ties and cultural connect even as it underscores New Delhi’s commitment for an equitable and sustainable partnership between two sovereign nations. Oli has repeatedly indicated that he wants to maintain a balance between India and China. New Delhi should try to give him no reason to tilt that balance in favour of Beijing. The article was first published on dailyo.in 27 June 2018.